The Art of Being Human is the first in the series of Shambhala Training weekends and the first program in the Way of Shambhala curriculum. 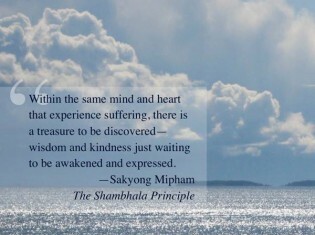 The Way of Shambhala offers a structured path of meditation and a complete introduction to the foundations of Shambhala Buddhism. Open to people of any spiritual tradition, this series provides a strong foundation in mindfulness-awareness meditation practice, wisdom teachings, and physical practices rooted in the ancient traditions of Shambhala and Tibetan Buddhism. There is no prerequisite. Everyone welcome.